McKeonTyres Longford are offering a 5% discount off your bill if you quote “web” when making a booking for any of our services. Ever wondered what the markings on the side of a tyre mean? 195: This is the section width of the tyre. That means the overall width of the tyre in mm. 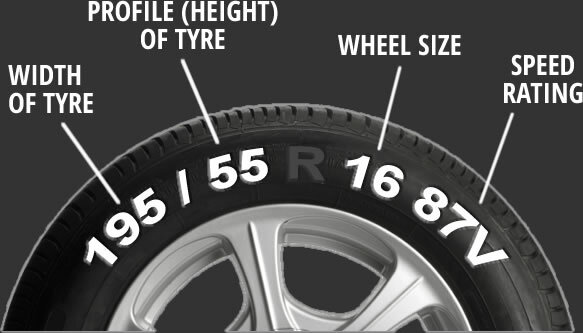 55: This is the aspect ratio of the tyre. That is the sidewall height of the tyre as a percentage of the section width. 16: This is the internal diameter of the tyre. 87: This is the load index. How much weight the tyre can carry. V: This is the speed index. The maximum speed the tyre is designed for. If your tyre tread depth limit is below 1.6mm you are liable to a fine and prosecution. Your tyres may be considered unroadworthy for reasons other than tread depth, such as cuts, cracks or bulges. So if you have any concerns call into us and we will check your tyres free of charge.